Canadian miner Kinross Gold Corporation (TSE:K), the world’s fifth largest gold producing company, acquired exploration and mining rights for potential high-grade gold-silver deposits in Russia. Kinross Gold’s subsidiary — Chukotka Mining and Geological Company (CMGC) — won auctions entitling it to develop two gold-silver prospective areas located in the Chukotka region in the far east of Russian. The Erguveemskaya perspective area consists of a number of precious metals’ ore-bearing zones, and contains Corrida occurrence that has initial resource potential amounting to about 1.19 Moz of gold with the average grade of 28 g/t, and 10.9 Moz of silver with the average grade of 261 g/t. The Pepenveemskaya area contains an initial 1.9 Moz of gold with an average grade of 5.3 g/t plus 91.9 Moz of silver with an average grade of 246.6 g/t. Current resource potential for both areas is estimated to comply with the Russian standard of reserves and resources to report as a P2 exploration category, and has a good growth upside. CMGC paid Russia 22 million rubles (approx. US $720,000) and 34.43 million rubles (approx. $ 1.12 million) to obtain licences on the Erguveemskaya and Pepenveemskaya areas respectively. Kinross is developing a number of projects in Chukotka now, including the Kupol operating mine, the Dvoinoye project currently under construction, and the Vodorazdelnaya prospective exploration zone. 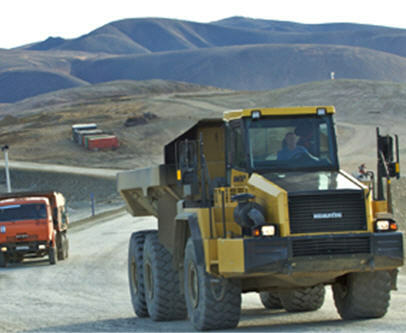 The production costs for Kinross’ gold operations in Chukotka are the least expensive compared to its other projects, mainly because of high quality of ores. At the same time, the Kupol and Dvoinoye deposits have a limited volume of resources in-situ. The acquisition of the Erguveemskaya and Pepenveemskaya prospective areas allows the company to secure additional gold and silver resources in the region.